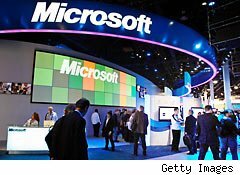 For the past 14 years, Microsoft (MSFT) has kicked off the Consumer Electronics Show, or CES, in Las Vegas. The software giant's keynote address has set the tone for annual exposition where tech companies of all sizes showcase their latest wares. But Microsoft is announcing that next month's keynote will be its last. The tech bellwether will pull out of CES entirely after that. The Tech King is Speechless? Microsoft's explanation is that the timing of its product introductions just doesn't coincide with the popular show's January calendar. Mr. Softy, after all, doesn't refresh its software products on an annual basis. It will rarely have a shiny new toy to unveil, and when it does -- last October's debut of the motion-based Kinect controller for the Xbox, for example -- it sticks to its own release schedule. However, it's not just a matter of Microsoft's final keynote speech taking place next month. When the 2013 show rolls around the tech titan won't even be hosting a booth in the cavernous conference center. No, I'm Breaking Up With You First! Reports are starting to surface that this may not have entirely been Microsoft's decision. Show organizers are trying to move in a new direction, some suggest. Microsoft, quite frankly, isn't the tastemaker it was 14 years ago. On the surface, Steve Ballmer's company is inching in the right direction. Microsoft continues to grow year after year. However, it's simply not growing as quickly as many of its peers. Apple (AAPL) now commands a larger market capitalization. Microsoft also represents the old guard of tech. Even in the world of operating systems, traditionally Microsoft's stronghold, it is Apple's iOS and Google's (GOOG) Android that are the platforms of choice on the smartphones and tablets to which consumers are turning instead of firing up their PCs. This doesn't mean that Microsoft isn't important. Windows is still the world's most popular operating system. Microsoft Office is the top dog among productivity suites. Even the Xbox 360 has emerged as the leading gaming console, giving Microsoft some welcome street cred with diehard gamers. Microsoft matters. It probably always will. However, it just doesn't seem as relevant -- and definitely not as cool -- as it did in the late 1990s when it began its run as the conference's keynote player. It's understandable if the expo organizers are interested in moving in a new direction that reflects the show's forward-thinking nature. Under that scenario, it's also completely understandable why Microsoft's best way to save face was to bow out of the show entirely instead of having to rub elbows on the show floor with much smaller players demonstrating their upcoming gadgetry. Will there be tension as next month's keynote closes in? Will attendees encourage verbal fisticuffs between Microsoft and the organizers? If so, the irony will be rich. The consumer tech industry will be looking forward to a Microsoft keynote for the first time in a long time, but for all of the wrong reasons. Longtime Motley Fool contributor Rick Munarriz does not own shares in any stocks in this article. The Motley Fool owns shares of Microsoft, Apple, and Google. Motley Fool newsletter services have recommended buying shares of Apple, Google, and Microsoft. Motley Fool newsletter services have recommended creating a bull call spread position in Microsoft and Apple. Marvel is one of the most recognizable brands in the comic book industry, owing its fortunes to popular characters like Spider-Man, X-Men and The Hulk. But Marvel’s current success follows a serious slump. In late 1996, after declining sales of comics and trading cards, the company filed for bankruptcy. In 2000, the company released the movie X-Men — a huge success, which grossed almost $300 million worldwide. Two years later, Spider-Man was released, becoming the top grossing movie of the year. In 2009, Marvel Entertainment was purchased by Disney for $4 billion. This summer the company released X-Men: First Class, which has already grossed over $353 million worldwide in theaters. Old Spice, a classic American brand that has been around since 1938, attained huge popularity by the 1970s. By 1990, however, the brand had become tired, associated more with its aging customer base than anything else. In 2000, the company, now owned by Procter & Gamble, came out with Old Spice Red Zone and revamped its advertising campaigns, focusing on the younger generation. Popular online ads featuring the Old Spice Man went viral, propelling Old Spice to the lead in the body wash market. In June 2010, sales increased a whopping 107%. With its Macintosh line, Apple was a premiere personal computer manufacturer in the late 1980s. In 1985, Steve Jobs left his position after being marginalized by the board and new CEO, John Scully. The company did well through the end of the decade, but performed poorly in the mid 1990s. Jobs returned in 1997 and, after 18 months of losses, the company received a $150 million investment from Microsoft. In 1998, the company released the iMac, followed by the iPod in 2001. These products marked Apple’s return and spurred its rise as a competitive consumer electronics company. Since then, its top position has been cemented by the wildly popular iPhone and iPad. Apple is now one of the world’s most loved and followed brands.